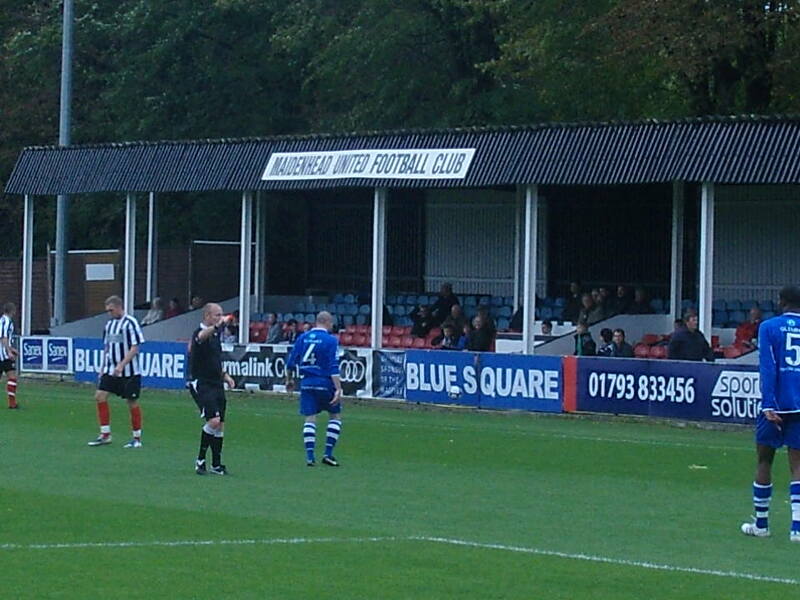 About York Road York Road has been the home ground of Maidenhead United F.C. since 1871 and is acknowledged by the FA to be the oldest continuously-used senior association football ground in the world. The ground was initially the home of Maidenhead Cricket Club and it was with their kind permission that shortly after the Football Club began in 1870, Maidenhead played their first match at York Road on Thursday, 16 February 1871 against Marlow. 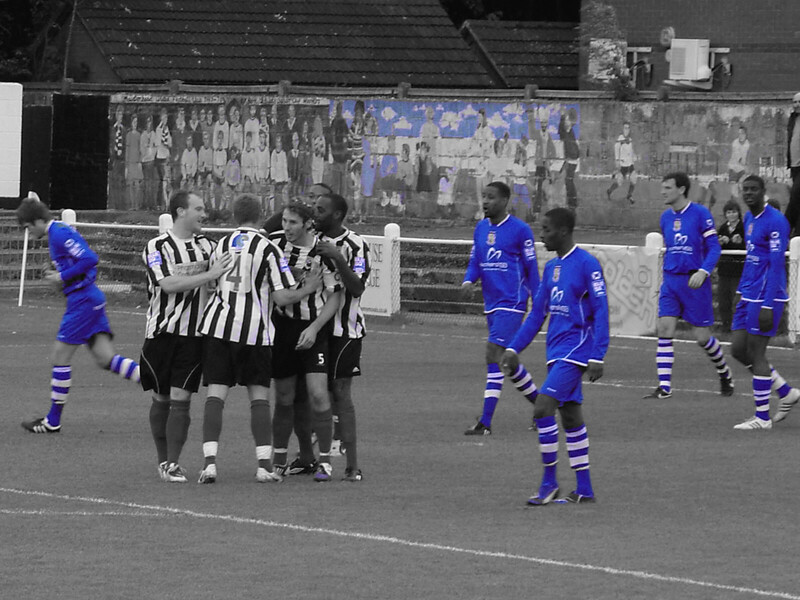 The Magpies have continued to play home matches here, without a break, to the present day. The current capacity of the ground is 3,000 and holds a “B” grading. The club’s record attendance 7,989 for the 1936 FA Amateur Cup Quarter-Final Tie against Southall. The ground facilitates fans in a mixture of covered all-seater stands, covered and uncovered traditional terraces and flat concrete by the side of the pitch. As well as the normal facilities for lower-league football, the ground hosts Stripes Bar which can be hired out for functions. How to get to York Road One of the easier grounds to get to, especially by train. The ground is short walk from Maidenhead station which is on the London Paddington to Reading line (stopping trains only). From the station turn left into King Street and almost immediate right into Queen Street. The first right is York Road and the ground is a couple of hundred yards down on the right. If you are coming by car you will inevitably come via the M4 to junction 8 where you need to then follow the A308(M). At the roundabout turn left onto the A308, and follow into the town centre, across the railway and turn right into King Street, then right into York Road for the ground. Parking is in the car parks in Grove Street or The Broadway, both less than five minutes from the ground. Getting a ticket for York Road £10 for Adults and £2 for Children is a bargain to watch football at York Road, payable on the gate. Our last visit – Maidenhead United 4 Bromley 0 – 3rd October 2009 On the 11th November 1871 the first ever games were played in the FA Cup. Fifteen teams took part in the first round, including the fantastically named Hampstead Heathens. Of those fifteen teams only one team still plays in the English league structure – Maidenhead Town. Whilst Crystal Palace FC made it through to the semi-final, they were actually nothing to do with the club that now plays at Selhurst Park. Queens Park, who went on to the semi-finals as well, now play in the Scottish Leagues, leaving The Magpies as the sole representatives of a long forgotten age. They went onto reach the FA Cup semi-final the following year, and quarter finals in the next two tournaments making them one of the most successful cup teams in the amateur era. Just a few months after that FA Cup game in 1871 the club played against local rivals Marlow at York Road, the same York Road where the team play today – making it the oldest continuously used senior ground in the world today – quite a feat for any club. The ground is typical in design for the Blue Square – a number of small stands, a more than amble capacity and of course a lovely little bar. I was going to be on my own for this one, with Lolly choosing the delights of Legoland some 5 miles down the road with the rest of the Fuller girls rather than watch the likes of Arian Tajbakhsh and Bobby Behzadi – what is wrong with children today? Few people know that the team were actually managed by ex-West Ham legend Alan Devonshire for many seasons. Devo took the team to a number of trophies including the Isthmian Premier League title, the Berks and Bucks cup and of course the Isthmian League Full Members Cup in 1997. Their time in the Conference South, as it became know as, was painful at times. They were actually relegated in 2005 but gained a reprieve after the meltdown at Hornchurch. They weren’t so lucky the next season, finishing in bottom place and dropping back into the Southern League. Their demotion lasted just twelve months as a run of form that included 12 victories in the last 14 games saw them reach the play offs where a victory against Bath City took them back up. Last season was a success for the club, and actually could have seen them in the play offs at the end of the season if they continued their early season form. A final sixth place finish was harsh on the club, but with work required on the ground to bring it up to Blue Square Conference level in some ways it is fortunate that they remained at this level. This season form has been inconsistent although they have played most of the top teams early in the season. The visitors for today’s game Bromley had faired a little better, coming into this game on the back of a seven game unbeaten run….so score draw written all over it! The ground is probably the closed to a town centre I have ever come across. Past the Broadway centre, do a right and park next to HMV for the ground. The last few weeks the Stripes had only got a few hundred fans so I felt safe in leaving Legoland, sanctuary for the female Fullers for the afternoon at 2.30pm and still having a quick Guinness Extra Cold in the homely bar prior to kick off. Autumn had certainly arrived. Another Blue Square South ground surrounded by trees, another venue where they would lose countless balls during the season. A strong wind blew down the pitch, meaning the toss would be quite important for once. The ground was hardly full to busting, although they were one of the first grounds I have come across that still has a mural behind the goal to boost the numbers. After my £10 to get in, £2.95 for my beer, £1 for a programme (a bargain) I indulged in a Pukka pie and chips and still had change from £20 – I am still amazed that I had paid that when I had paid £28 for a childs ticket at Legoland an hour before – family entertainment my arse. To tell the truth I didn’t expect alot from the game and the first five minutes just provided that the wind would be a big winner this afternoon. But sometimes the strangest things happen, and this game was one of them. 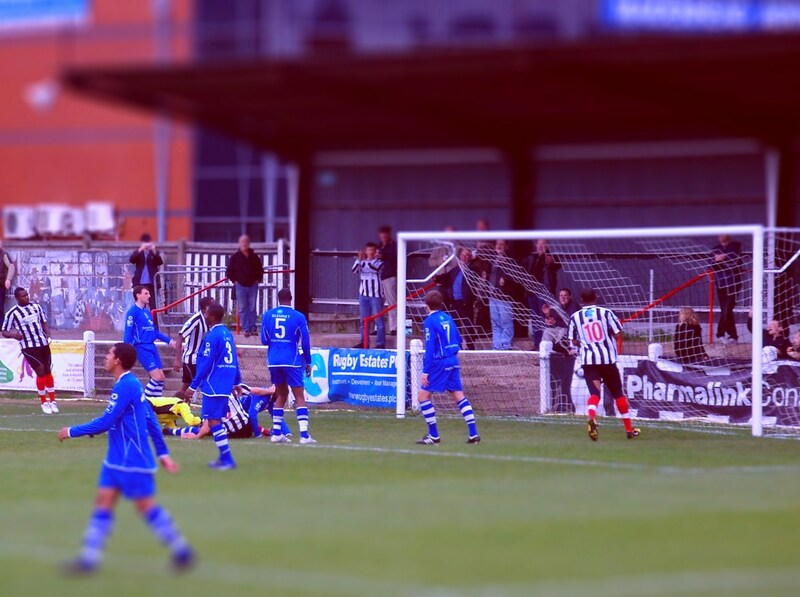 Maidenhead had started the season poorly, four points after eight games. But recently (apart from a shocking defeat at home last week to Truro City in the FA Cup) things had been looking up with two wins and a draw coming into this game. The smallish crowd didn’t have to wait long. 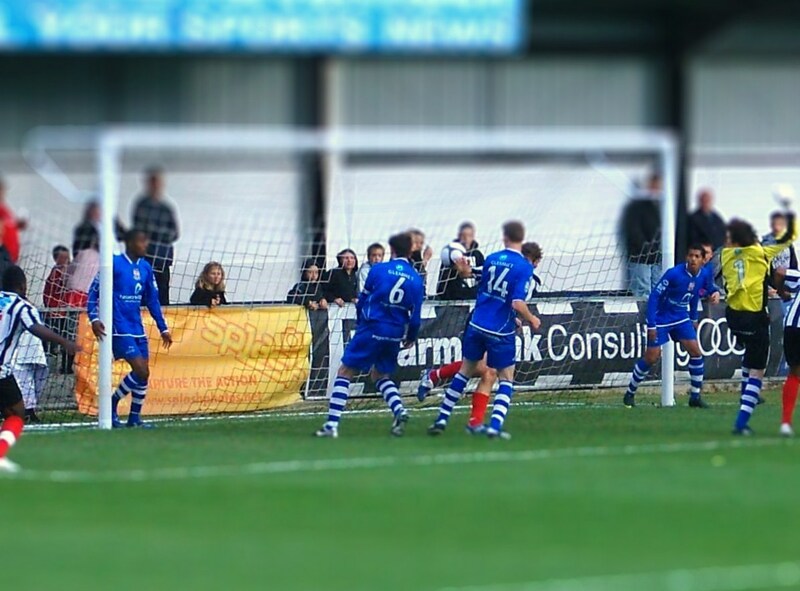 A Maidenhead free kick on seven minutes from the right held up in the wind and captain Mark Nisbet turned the ball in. Bromley tried to play their passing game, ignoring the impact the wind could have and created very few chances in the first half. Mark Goldberg paced his technical area, scowling that his team simply could not create any chances. Maidenhead, on the other hand, knew exactly what they needed to do in the second half and the ball was regularly played long to the wings. The pitch seemed huge and the home team worked the width. A second goal came in the 55th minute when Will Hendry hit an absolute rocket from 25 yards that did not need the wind blowing down the pitch to hit top speed and almost rip a whole in the net. You wont see many better goals on the weekend that Mr Hendry’s strike. Bromley had a few changes but they simply could not break down a very solid Maidenhead defence. Two should have been three when Maidenhead were awarded a fortunate penalty but Williams made amends in the Bromley goal with an excellent save. He was not happy that the decision had been given in the first place. His mood didn’t get any better as his defence when walkabout in the final ten minutes and Maidenhead should have scored two or three more. They eventually got the third in the 85th minute when Daniel Brown turned in from close range and a fourth added the icing on the cake when Alex Wall tapped in from close range. An unfair result? Maybe but there is no doubt that Maidenhead deserved their third victory in the past four league games and shooting them up the table to the dizzy heights of fourteenth. Five minutes after the final whistle I was back in the car and heading back to Legoland to collect my cargo. Forty minutes queuing for Jungle Coaster or forty minutes of Blue Square action – you know where my vote goes.